Maritime trade reached its peak in the Song and Yuan periods, which was dubbed “the golden age of Chinese sailing” by scholars. However, even at that time, the government adopted a relatively conservative attitude toward the seas. Pictured here is the Quanzhou port. The Song Dynasty (960-1279) marked the peak of ancient China’s maritime trade in terms of the number of ports and scope as well as the scale and variety of goods. At its height, it had no fewer than 20 ports for maritime trade. The Song’s 60 or so trading partners ranged from East Asia, Southeast Asia and the Indian Peninsula to as far away as the coast of the Red Sea and East Africa. Maritime economy remained weak throughout Chinese history due to the national tradition of emphasizing agriculture. Rulers overlooked its value and restricted the maritime activities of citizens, but the Song Dynasty prioritized this field. Relative to the Han and Tang periods, the geopolitics changed enormously in the Song Dynasty. The Silk Road was successively controlled by competing kingdoms, such as the Liao, the Western Xia and Jin, blocking Song’s land route to the Middle East, West Asia and Europe. Given the circumstances, the Song had to rely on the sea for trade, thus the court adopted policies to incentivize maritime trade. First, the inland situation had a great impact on maritime policies. In the early Northern Song period, Dengzhou Port became a sea hub connecting the Song Dynasty and the Kingdom of Goryeo. In 1014, it set up a station reserved for receiving Goryeo envoys, and other major ports followed suit. However, the Song court suspected that Goryeo envoys leaked sensitive information about domestic geography and circumstances to the Liao, a mounting military threat. As a result, it prohibited Goryeo envoys for a time. Emperor Qingli banned maritime trade and ordered the closure of Dengzhou Port in 1041. The Song, Liao and later the Jin were enemies, and Goryeo was adjacent to Liao and later the Jin. For a time, the Song court prohibited merchants from traveling to Goryeo in case they collaborated with its enemies. Historical records document the harsh punishments meted out to merchants who defied orders not to set foot in Goryeo, Silla, Dengzhou or Laizhou. Violators would be put into prison for two years. Such restrictions lasted until the establishment of the Song’s alliance with Goryeo against Liao. Also, the Song court considered domestic and foreign merchants to be a threat to national security, so it adopted tough measures to maintain the stability of coastal areas. For example, traders had to provide detailed information about crewmembers, ships, cargo and destination. They also needed three local wealthy sponsors. Sailors weren’t allowed to navigate to enemy countries or those that could endanger Song power. Voyagers had to follow exit and entry procedures at the appointed Maritime Trade Commission. Excessively long stays in foreign countries were forbidden. Also, people were not allowed to take weapons or materials that could be made into weapons. Foreign ships with gifts of tribute to the imperial court had to provide official evidence to identify themselves as legal envoys and travelers. Ships had to enter and leave through designated ports while foreign merchants had to live in fanfang, a settlement for foreigners. These regulations were enforced by the Maritime Trade Commissions. In addition, individuals and groups involved in the maritime economy moved often, which was totally different from the inland residents, who were reluctant to move from their native districts. To improve governance, the Song court established a new household registration system to manage people engaged in maritime activities and adopted the baojia system, an administrative system that grouped civilians into decimal units. The system dates back to Wang Anshi’s reform in the 11th century. The function of the system was to control local society through registration, mutual surveillance and collective responsibility. Any failure to report illegal behavior or suspicious persons meant group punishment for all members of the unit. All in all, the Song rulers held a conservative attitude toward the sea and considered it an extension of their terrestrial domain, which meant that their maritime policies were made on the basis the development of inland regions. Coastal inhabitants relied on the sea to get by. Most of those who lived along the coast in the Song Dynasty engaged in fishing and trade. A representative household was danhu. They were not allowed to reside on the land and instead had to live on a boat and earn a living by catching fish and collecting pearls. Households of such kind could be found in coastal area of Guangdong, Guangxi and Fujian provinces. Maritime trade involved coastal households, fishermen as well as officials, monks and Taoist priests. The merchants transported silk, porcelain and tea to foreign countries and shipped back specialties, such as perfume, pearl and ivory. Domestic trade was largely carried by sea. For example, merchants often transported rice by sea from Guangdong Province to Zhejiang and Fujian provinces. A handful of merchants couldn’t return within the definite time frame allowed by the court due to ocean current, wind direction and other problems. They had to temporarily or permanently live in foreign countries, such as Goryeo, Japan, the Indonesian Islands and the Malaysia Peninsula. Their accurate business information from overseas enabled domestic merchants to make more targeted decisions and earn more commercial profits. Also, domestic merchants could quickly sell all their goods and conveniently purchase foreign specialties. Driven by profitability, merchants continued to expand their trade in terms of scope of trade partners and variety of goods, thus opening overseas markets and facilitating the sustainable development of maritime trade. Also, civilians became more skilled in exploiting the seas due to the advancements in shipbuilding and sailing. In the Song Dynasty, ships with roomy hulls and watertight compartments could resist stormy waves. Sailors used to navigate by observing features of the earth’s surface and angles between stars and sea level. The introduction of the compass gradually broke these navigation limits and made all-weather sailing a possibility. In circumstances like this, China began to replace Muslim countries and dominate East and Southeast Asia, which gave birth to a maritime trade system led by Chinese merchants. A thriving network of maritime trade took shape among countries along China Sea Rim, Indian Ocean and Arabian Sea. The merchants of the Song played a major role in its maritime activities while official diplomatic, political and economic affairs were at large constrained within close-shore areas. The difference between attitude of the common people and that of the rulers meant further exploration of the ocean was doomed. As the court placed limitations on merchants that hindered their ambitions to exploit marine space, Song merchants stuck to regional maritime trade, rather than establishing a global sea route trading network. Handling maritime issues based on the inland situation in a conservative mindset, the Song Dynasty is indeed the epitome of ancient Chinese regimes. In contrast, people who lived along the coast have been passionate about maritime activities throughout Chinese history. The two forms of value led to a maritime cause that was managed by official and merchant forces. 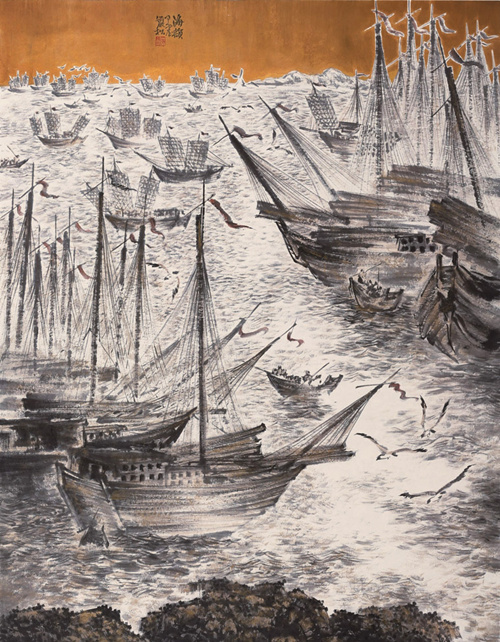 Chinese ships frequently transported goods between the northern Indian Ocean and sea area of East Asia, and the business reached its peak in the Song and Yuan periods, which was dubbed “the golden age of Chinese sailing” by scholars. However, at the same time, a series of voyagers and adventurers from Spain, Portugal and Italy started their journey from the western Eurasian continent in search of a new sea passage. Later, gunboats and commercial ships from Netherland, Britain and France arrived in the northern Indian Ocean and the western Pacific Ocean—the places where Chinese merchants were once active—thus successively dominated the maritime trade. Zhang Hongli is from the College of Humanities and the East China Sea Rim Research Institute at Zhejiang Normal University.